The Manfrotto 055XB doesn't have the rotating column which can be found on the 190XPROB. If you want this, you'll have to pay £15 more for the 055XPROB. 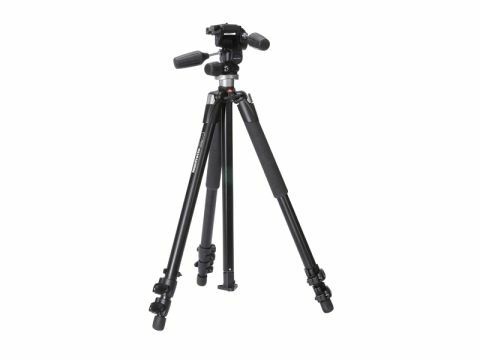 This version is cheaper and lighter than the 'rotating' version, which could be important because this is a more substantial tripod, with thicker, longer legs that give a higher and stiffer platform to shoot from. However, it's only 600g heavier. The extra size and sturdiness make a big difference. Whereas the 190 doesn't always feel up to the job, the 055 does. It's not much larger when folded, either. Low-angle shots are easy because the 055 enables you to remove the centre column completely, and it goes high enough without the centre column to make this practical for outdoor photography. The 804 head is a trifle 'sticky', but the weight and stability of the 055 make this less of an issue.